Best Floor Lamps for Bright Light - Perfect for Reading and Ambience! / Best Floor Lamps for Bright Light – Perfect for Reading and Ambience! Lamps are an important accessory in any home. They let you customise how your home will look and feel to everyone who comes to visit and it’ll make a big difference to the vibe you’re giving off. When used right a lamp can be one of the most important features in your living room. In this best floor lamps for bright light reviews guide you will learn about a few different floor lamps that give you the option for huge amounts of light, and for different moods! There’s a big difference between a good lamp and an average lamp. A good lamp completely lights up the room and is strong enough to provide some serious light. It can create ambience and be used without your main electrics. 1 Best Floor Lamps For Bright Light Reviews and Top Picks! Best Floor Lamps For Bright Light Reviews and Top Picks! Floor lamps are very popular for a number of reasons. Primarily they’re versatile. Because of their lightweight nature they can easily be repositioned around the room and their small size means they won’t take up much space. This means you can move a room around completely with the light to match. In my living room I have some lights by Allen Roth, but because the way the room is shaped, the ceiling lighting just isn’t enough. A good floor lamp will be able to replace the need for cumbersome electrics and all you’ll need to do is plug it in. A good floor lamp is a great investment for your home and can do a lot for the room. We’ve found three great models for you to consider on your search. producing various light solutions to your home. They have expert engineers and designers all focused on their one goal, bringing the light of outside into your home. They provide a balance between contrast and brightness in their product to keep it easy on the eyes. This allows you to focus for longer and make the most of the light. The OttLite lamp is thin and lightweight weighing only 10 pounds. It’s easy to set up and can be placed pretty much anywhere in reach of a plug socket. A lot of the positive feedback comes from those who are impressed by how maneuverable the product is and how it fits in any room. It’s a fairly simple but stylish design with a thin frame and overhead bulb. This makes it perfect for reading because you won’t have any awkward shadows getting in the way. OttLite precision technology helps your eyes relax so you can focus for longer. With a powerful bulb this overhead light is suitable for lighting a whole area of a room. It makes it perfect for creating a mood or highlighting a specific space in your home. 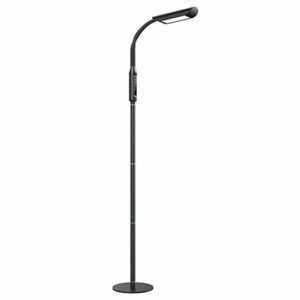 One of the most energy efficient floor lamps on the market it has an 18 watt bulb that is built to last. It can give approximately 10,000 hours of lighting with no dip in quality or strength. Perfect for a contemporary style, this lamp has been built to look good as it functions well. It has a matte finish and will look great in any modern home. OttLite are well known as a solid brand and they produce a lot of lamps for the home. Overall the feedback about the company is very positive and says a lot about the reliability of what they produce. This lamp shows how they’ve taken into account the needs of the body and the home by making an energy efficient, yet powerful device. A great asset for you and your home, this lamp is definitely worth checking out. Vava are a great brand for lamps and other lighting because of the thoughtful construction behind each piece. They’ve done a good job of analysing the needs of the customer and then exceeding them. So much so that a lot of Vava floor lamps have been used outside the home and in businesses like tattoo parlours where a consistent light source is essential. Again this is a simply designed lamp with a thin base and large overhead bulb. They’ve opted for a more discreet, less flashy, style but in this trade off they’ve made the floor lamp easy to transport. It’s simple to setup and weighs only 6 pounds. This means you can move it around with complete ease and get the lighting that’s right for your home. This lamp comes equipped with 5 different temperature levels so you can gauge the glow coming from your lamp accurately. There are 5 different levels of brightness for those with more or less sensitive eyes. This means you can use it with confidence for longer. This lamp is built with an LED bulb. It’s energy efficient and can see up to 50,000 hours of use with no trouble. It uses only 12 watts of energy but can produce 1815 lumens which is an impressive ratio. An innovative touch control is fitted to the lamp which allows for easy change of light colour, brightness and you can even set a timer. This lets you take control and make the most of your floor lamp. Vava have built a lot of really impressive technology into such a small unit showing their efficient nature. The feedback on the model and the brand has been overwhelmingly positive with people praising the useful nature of the floor lamp. If you’re looking for something which will do the job and then some then this floor lamp is one to consider. Baltoro know how to create useful lighting and have been doing so for a number of years. You may not have heard of the brand but they are becoming well known for introducing key features into your lamp which takes it to the next level. 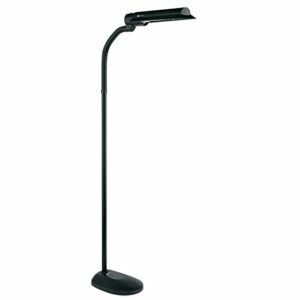 This lamp is available in a white or black and has a tall, long, thin frame with a curved head. It has a built in step dimmer and the head is completely adjustable so you can focus and direct the light. The whole lamp weighs only 10 pounds which makes it easy to pick up and move around the home, with easy setup instructions. Built to bring you the natural sunlight indoors this lamp is equipped to give white light. This is much better for the eyes and again perfect for those who read. The softer light spreads over an area gently giving unique illumination. Longer lasting LEDs are used in this lamp and are built directly into the head. There’s no need to replace any bulbs as the fitted ones are expected to last for a minimum of 20 years. These are also cool to the touch and don’t give off any heat minimising any risks. Made to only consume a small amount of energy it takes only 12 watts to power this lamp so you won’t be surprised by any startling bills. The Baltoro-Power floor lamp is made to be innovative and useful. It’s well suited for those who appreciate natural light and want a hassle free lamp with no need to replace bulbs over time. Again the feedback on this lamp is very positive and people appreciate the type of light offered here. If you’re an avid reader then this lamp will make a lot of sense to you. 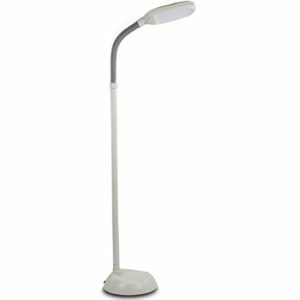 Home electricals is a busy market and there are countless varieties of floor lamp available for you to buy. We’ve chosen these three not because they’re necessarily the fancied units out there but they have been intelligently constructed by people who understand lighting technology. Each of these units offers simple style and efficiency which is perfect for any home. They aren’t imposing but are still able to light a room completely on their own. They each offer a great deal of value because of their long life spans and low cost nature. A good floor lamp is a great investment so if you’re looking to kit out your space with some extra lighting then you should definitely learn more about these three models.